Buy this car seat with confidence. With my son I can honestly say I did not give that much thought to choosing a car seat. We bought a Mothercare combi system with one included. Saving money was at the forefront of my mind. It was heavy and offered very little in the way of additional features and support to his little body in regards to the seating position. The Joie i-Level does. With number two arriving imminently, I am much more aware of the amount of time spent travelling, so safety and protection is much more of a priority, as is comfort and practicality in terms of ease of fitting. Introducing The Joie I level. 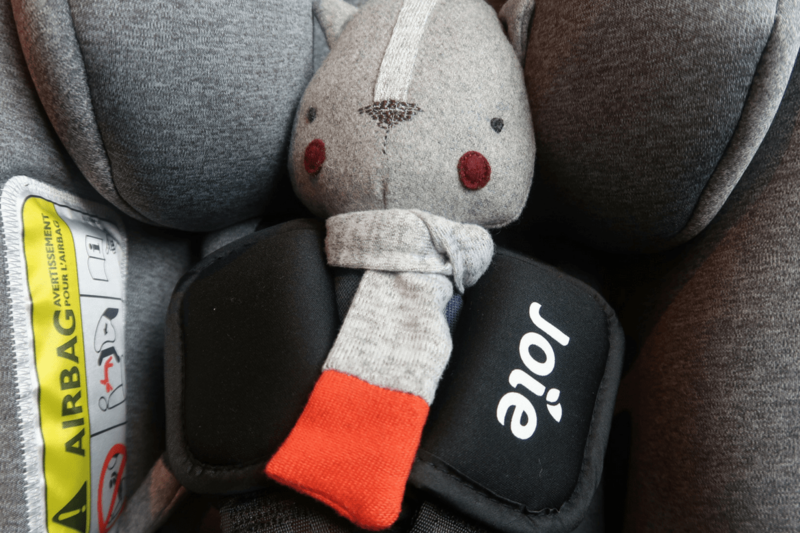 Joie is one of our recommended by mums brands, put forwards for its reliability and affordability, alongside its parent tested and approved products. The i-Level rear facing car seat offers a smart, solidly designed, new to the market car seat meeting with the new i-Size regulation (ECE R129/00) which offers reassurance and comes with an ISOFIX base to provide everything you need to install this in your car and go! We all want a product with longevity. The i-Level is for babies weighing 0-13kg (around 28lbs) which dependent on how much of a muncher your offspring is the seat will last you till your child is 18-24 months. Tick number one. No need for a carrycot. Previously I considered that multiple travel systems were my preferred buy for convenience to cover all babies travel needs, to grow with your child. I changed my mind. Given that safety recommendations endorsed by manufacturers advocate that you shouldn’t have a child in a car seat for more than two hours at a time I was considering a carrycot attachment a necessary purchase for the new-born stage. Another product to find storage for. The Joie i-Level’s revolutionary design converts from an infant carrier in an instant with its ‘sleepytime tilt’ which reclines to an 157° angle for the most ergonomic position for your baby to promote a healthy spine and improved oxygen levels (usable in the vehicle or on a pushchair). It adjusts with ease at the touch of a lever at the back and does so in a simple slide motion so you don’t have to worry about jerky transitions. The i-Level’s versatility in usage in terms of it essentially being two products means value for money and more choice in terms of choosing an accompanying stroller. This helps negate the downside that some travel system bundle strollers are considered bulky in terms of dimensions, size and weight. The i-Level is compatible with the Joie MyTrax, Chrome DLX, Litetrax 4 pushchairs and other brands using Maxi Cosi style adapters (sold separately). As we were so impressed with the quality of the i-Level we purchased a Chrome DLX as it is lightweight, easily foldable, with a large shopping basket, swivel wheels and adjustable handle for a tall daddy! Pick a pushchair design to suit your lifestyle- do you want a 3-wheeler, standard 4-wheeler buggy, ATP (all-terrain) or twin/tandem? Does it need to be forward and rear facing? Do you need a one-handed or fast-fold? And how big is your car boot? Buy smart. It comes with a large retractable, removable sun canopy which features a zip-open panel. Mum translation, you don’t have to buy those annoying window sun visors that fall off constantly and leave sticky round marks on windows. You also don’t have to worry about over heating as the zip means baby will still be well ventilated. The canopy is quite tight to pull up over but I like that as then you don’t have to worry about it flapping around out of position when driving. It has a multi-position, ergonomic carry handle with soft-grip. Mum translation, no sore red marks on hands. At 9.95kg I would say the seat itself is average weight. An accompanying in-car Isofix base. Mum translation, whilst a tad bulky you can just leave it in a vehicle. In reality the simple clip in, easy fit system is worth the cost compared to the time it takes faffing with routing a seatbelt through belt guides with a crying newborn. The installation instructions might initially make you panic but are actually pretty clear. Once you’ve figured things out (there are helpful videos online!) the seat fits securely into the car and fastens easily. Check the vehicle fitting list before buying. The The Tri-Protect headrest and patented Intelli-Fit™ foam offers the ultimate side impact protection. Mum translation, be confident in the product, it looks really well cushioned, thick and cosy and made me realise how ill equipped my firstborns car seat was! The Grow Together multi-height headrest and harness system adjusts simultaneously and requires no rethreading as baby gets bigger. Mum translation, no faffing. The 3 point harness is easy to buckle and padded covers lessen the risk of uncomfortable rubbing on sensitive skin. The removable full body insert is great for added support for newborns / younger babies, which along with the easy clean fabric means that any spills can be easily sorted. If we are talking pricing the seat retails at around £250 but is on sale for £199 on other so have a look around for the best deals. Given that an Isofix base alone can cost around £100, similarly a separate carrycot if you think about what you are getting in terms of security, versatility etc I think this is a really good buy. We give the seat a 5 out of 5 rating as can find no fault or improvement needed! What do you look for when buying a car seat? Do you have any Joie products? Note: We were gifted the i-Level for the purpose of this review, all thoughts and opinions are our own.